On a yearly basis the Aruban Trade & Indsustry Association (ATIA) organizes their People Management Seminar with the purpose of sharing knowledge and experience amongst its' members. Medwork is proud to have been part of the knowledge-center behind these seminars for many years now and this year participated in workshops about: Sexual Harassment at Work, The elderly employee and medical examination, and Sick Leave Managent and Re-integration. David Geelkens, Occupational Health and Insurance Medicine Physician at Medwork Caribbean N.V. and Carolina Lopez-Paz, lawyer at De Cuba Wever Attorneys at Law focused on the topic of re-integration and long term sick leave Absenteeism and prevention as well as re-integration can be approached in various ways and are subject to trends and market movements. In recent years the focus has shifted from a reactive approach towards absenteeism and reintegration policy to proactively managing the integral health of the working force. Anton Isaak, D.O. at Medwork and Monica Kock, lawyer at Monica Kock & Partners focused on the elderly employee in relation to the medical examinations for these senior employees. Part of good employer-ship is providing for a healthy and safe work environment. In order to determine whether or not it is medically safe for someone to perform certain duties, it seems a wise to choice to start implementing policies on medical examinations at work. But what can you do if an employee, at a given time in the course of his / her career, is no longer able to pass his/her “medical fit for work examination”? To define the term ‘elderly employee’ Monica Kock elaborated on the term pensionable age for workers on Aruba and quit quickly it proved to be a complicated and dense matter which was clarified by Monica to the satisfaction of the audience attending. Mrs. Salcedo, elaborated on the responsibilities and the obligations the different stakeholders need to consider with regard to Sexual Harassment at the workplace. The key stakeholders are Employers, Employees and the Labor Department as an extension of the Government as the regulatory body. Mrs. Salcedo also elaborated on where employers and employees can find the necessary assistance for the prevention of Sexual Harassment at the workplace and find support in those regrettable instances of a suspicion of Sexual harassment and/or when it is already identified. Mr. Bemer presented the legal frame work organizations and employees need to consider and be aware of while operating under Dutch Caribbean laws. Mr. Bemer provided the audience with the range and gradations of possible consequences employers can face for not complying with their legal duties and responsibilities of having and maintaining a safe and healthy work place for all employees. The take home message from mr. Bemer was a positive one: Unlike the previous topics where there still appears to be great need for legislation, regarding the topic of Sexual Harassment at Work al legislation is already in place on Aruba, now it’s actually up to the employers to start implementing and applying it. Save the date! 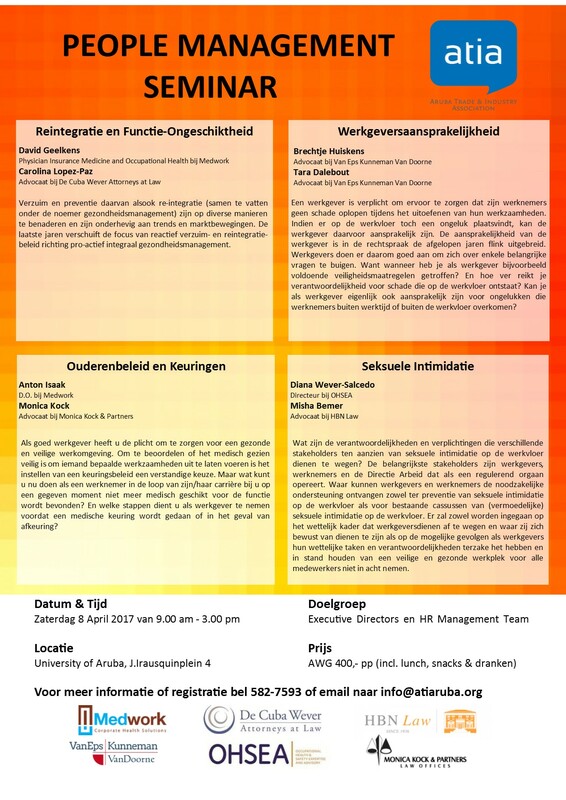 On Saturday May 11th another session of not-to-miss Masterclasses in Occupational Health will be given at the University of Aruba. Masterclass means taking you to the next level in Occupational Health and Ergonomics and our experts in this field wil be offering you plenty of practical tools for you to start implementing at your workplace right away. Craving Change three-day training at University of Aruba The University of Aruba is organizing an interesting three-days training with the purpose to create more awareness, recognize patterns and break through patterns. But also to reform and personalize your personal way of life. It starts with goals and this training aims to help you achieve your goals.